Cops Fighting Cancer is made up of police and civilian volunteers providing emotional, practical financial support making a REAL difference in the fight against cancer. 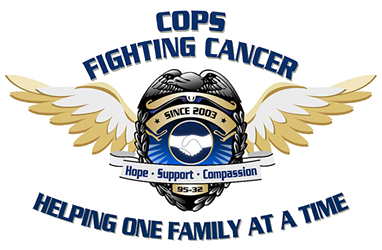 Cops Fighting Cancer provides individualized financial support to families with the “every day” financial obligations that we all face, rent/mortgage, car payments, insurance premiums, food, clothing, and other financial obligations. Cops Fighting Cancer focuses on the “most pressing need”, and works to meet it. This allows the patient and families to focus on getting better. A cancer diagnosis can be devastating and it is even more devastating when the diagnosis is that of a child. The entire world changes and now all the focus is on the person with the diagnosis or the child with the diagnosis. This is where Cops Fighting Cancer can help. Our volunteers understand the world continues to move forward while the world of the families battling cancer seem to stop. Cops Fighting Cancer lends a shoulder to lean on and asks what can we do? In many cases, its just being there to listen or it is providing a hug or giving a toy to bring a smile to a child’s face. Cops Fighting Cancer is made up of law enforcement officers and civilian volunteers. Our officers and volunteers work diligently with local businesses to establish a list of sponsors that can be called upon to help a family in need. We value our community and are honored to be a part of a community that steps up when necessary. It all started in August of 1987, when Jim Seneca, two weeks into his training at the police academy in Buffalo, New York, was diagnosed with leukemia. Just 26 years old at the time, Jim was devastated. He underwent six grueling months of chemotherapy as he battled cancer. This strong, 220 lb man was reduced to a frail figure weighing in at 165 lbs. Those six months were the hardest of his life. The violent spells of vomiting, losing all of his hair, and the endless doubt took their toll on Jim – to the point of wanting to give up. “At one point I thought it was just too difficult, and I thought that I would rather die,” says Jim. It was the support of family and friends that gave Jim the strength to make it through. They pushed him to keep striving forward, to keep fighting. Because of them, Jim made it. After that experience, Officer Seneca made a promise to himself. He vowed that he would be there to help others fighting the battle with cancer. It was out of Jim’s desire to provide Hope, Compassion and Support that Cops Fighting Cancer was born. Today, Jim is an officer with the Aurora, Colorado police department. 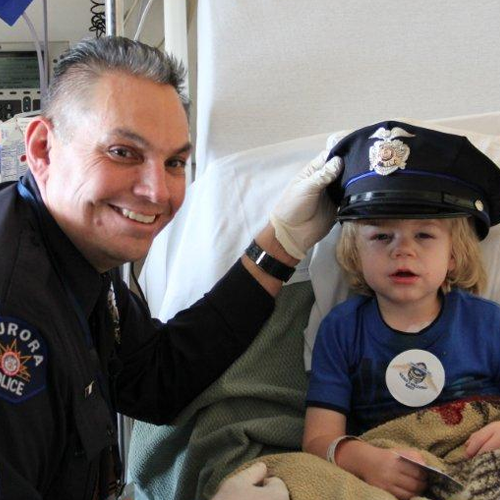 And, Cops Fighting Cancer has helped Colorado cancer patients and families for over 15 years. “It’s just simple compassion. I was spared so I could help these families.” Hope, Compassion, Support has become Officer James Seneca’s life mission. And it was this mission that led him to become a 7 Everyday Hero.